We hosted a pre-Thanksgiving brunch at our house a few weeks ago with some of our dear friends and my parents. It was such a great time of fellowship for the adults, and play time for all of the kiddos. Having a brunch is a nice change to the usual dinner party, and truth be told, breakfast is one of my favorite meals! The brunch spread was delicious that day. Everyone brought a little something to share, but since myself and my neighbor are both on a modified version of SCD, I decided to make a few SCD friendly items to make sure we had something to eat. 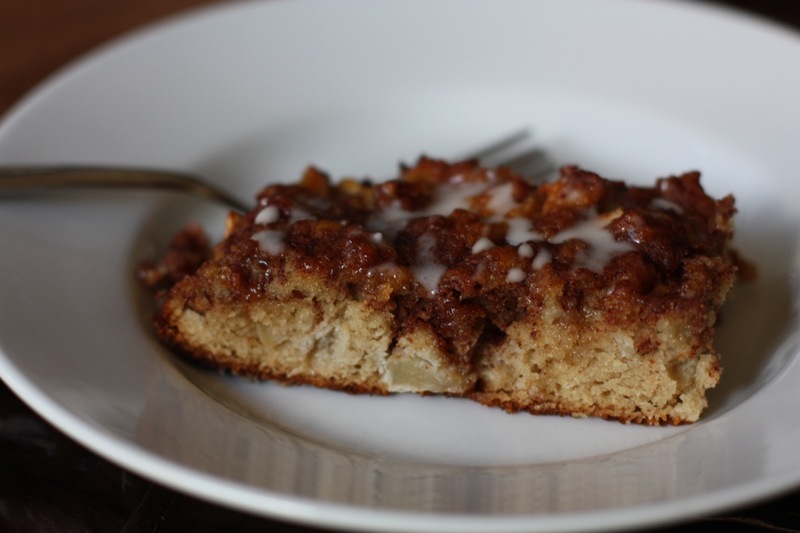 I made an oven-baked omelet with Gruyere and ham and this Apple Spice Coffee Cake. The cake is both Paleo and SCD legal, but if you want to indulge you can add the frosting on top which is made from a little powdered sugar. Otherwise, you can drizzle a little hot honey over each slice. Preheat oven to 350 degrees. Line a 9×9 baking dish with parchment paper, then lightly oil all sides with a little coconut oil or grapeseed oil. Toss together the apples, lemon juice, and honey. Set aside. 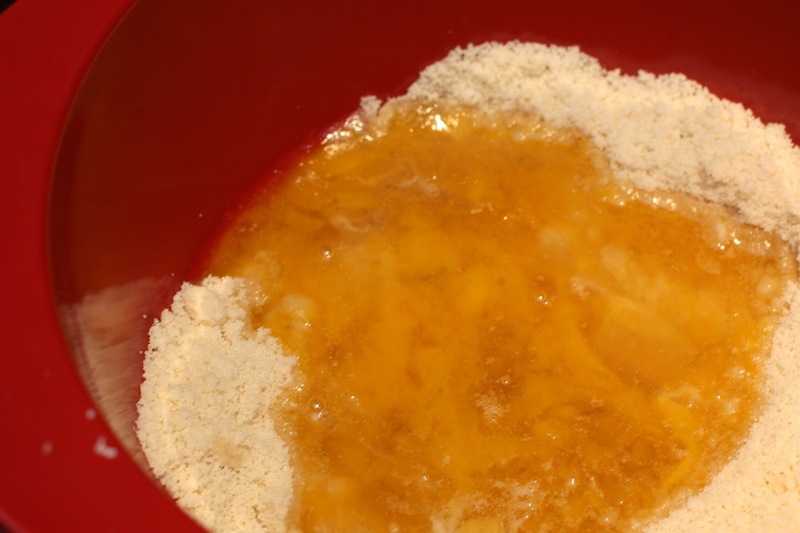 Mix the flour, baking soda, and salt in a medium sized bowl. Mix the coconut oil, eggs, and vanilla in another small bowl, then incorporate the wet into the dry ingredients. 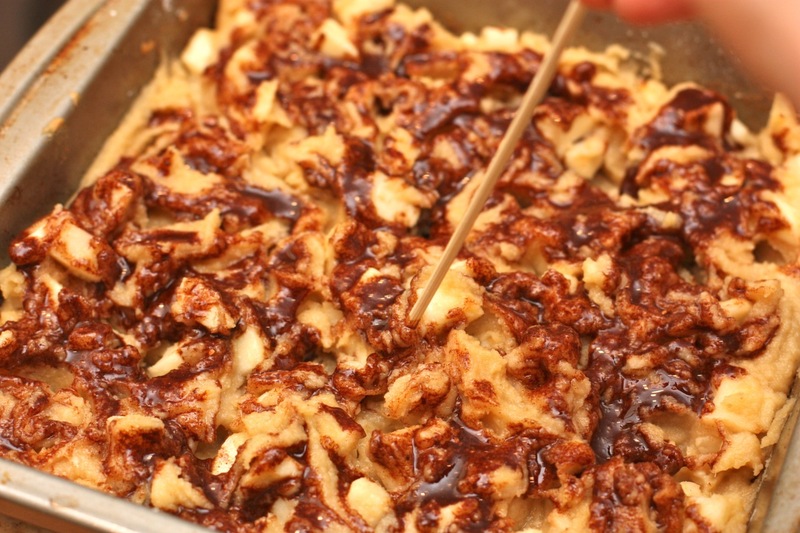 Fold in the apple mixture, then pour batter into the prepared pan. Use a spoon to spread it into an even layer. Mix the cinnamon swirl ingredients in a small bowl, then drizzle around the cake. Use a toothpick or a skewer to drag the mixture around and make swirly patterns in the batter. Bake for 20-25 minutes, or until toothpick comes out clean. Cool on a wire rack, then use a knife to loosen the sides from the pan. Invert the cake onto the rack and peel off the parchment paper. Flip the cake so it’s right-side-up, and serve with optional frosting or a drizzle of warmed honey. Yum! I am not gluten-free, but I still want to try it! Definitely going to try this on the weekend! The SCD version with the warm honey in lieu of frosting. This recipe is rubbish. Too much flour to liquid, it makes more of a crumble than a batter. Thanks for your comment. I’m sorry you didn’t have success with it. I’ve made it numerous times exactly as listed and it turns out. What kind of almond flour do you use? I am so glad I found your blog! This recipe is going to be bookmarked:) I adore apple cakes, but grains give me such horrible stomach issues. Therefore, I will have to give this recipe a try. Could you use another oil instead of coconut? Perhaps a vegetable oil? I love cinnamon so I’m very much looking forward to this recipe! Join Against All Grain on Facebook! Against All Grain · Recipes for a grain-free, gluten-free, lactose-free, and sugar-free diet!